Further strengthening its leadership in the Sri Lankan tertiary education, Nawaloka College of Higher Studies (NCHS) announced its partnership with the Ulster University in the United Kingdom to commence an LLB degree transfer program to offer a pathway to their internationally recognised Bachelor in Law (LLB) degree final year. This strategic collaboration paves a path for local students to complete a law degree from a leading university in the United Kingdom at a fraction of the cost of studying overseas. Nawaloka College of Higher Studies Chairman Dr. Jayantha Dharmadasa, Nawaloka College of Higher Studies Deputy Chairman/Chief Executive Officer Victor Ramanan, Ulster University Faculty of Arts, Humanities and Social Sciences Associate Dean (Global Engagement) Professor Paul Carmichael, British Council, Sri Lanka Country Examinations Director Rob Low and Nawaloka College of Higher Studies Senior Academic Advisor Dr. Dayanath Jayasooriya attended the launch event, which took place at the Nawaloka Hospital Auditorium, amongst a host of corporate luminaries from Nawaloka College of Higher Studies, Ulster University and the British Council. Students with Advanced Level qualifications or Students who have sat for the London A/Levels this year can apply and join the prestigious LLB Law Degree program, which is a ‘2+1 Degree Transfer programme’, starting from February 2019. This will provide the opportunity for students who are seeking a career in the legal sector to become a competent legal professional or work in international legal firms around the globe. Students have the option to study their final year in the UK or Northern Ireland after completing the first two years of the degree at NCHS Campus. “Our commitment to provide and facilitate quality education at an affordable cost to Sri Lankan students is unwavering. 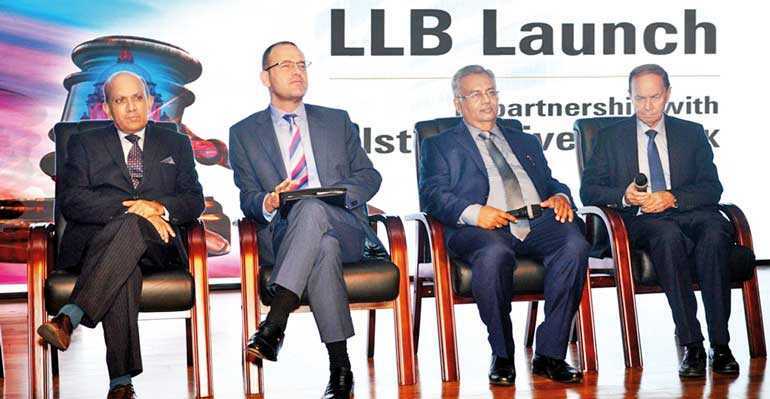 Collaborating with one of the highly rated UK law schools to introduce an LLB Degree programme was another step taken forward in our journey to become Sri Lanka’s leading higher education provider. The Ulster University in the UK offers one of the best law degree programs in Europe and we consider it a great honour to be able to bring this opportunity to our students. 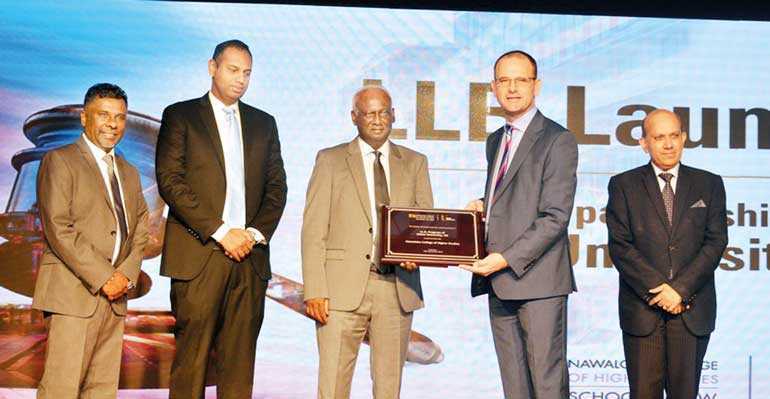 I congratulate both universities on their partnership and wish all the success for,” said Nawaloka College of Higher Studies Deputy Chairman/Chief Executive Officer Victor Ramanan. Ulster University provides an inspiring, engaging and intellectually stimulating environment for students of law at the undergraduate, post-graduate and CPD level. Research emerging from the School of Law is both pioneering and world-leading, with results from the UK National Exercise (REF) assessing their research as fourth overall in the UK, eclipsing the results of larger and more established law schools. The School of Law in the National Student Survey results 2017 had an overall satisfaction of 96%, way above the national average, and in the Guardian University League Tables for 2018 Law at Ulster ranks in the top 20 UK Law Schools. Nawaloka College of Higher Studies (NCHS) is a venture of Nawaloka Holdings, established with the commitment to provide the best in higher education, making it more accessible and affordable. Located in the heart of Colombo, NCHS aspires to play a central role in making Sri Lanka an international education hub of Asia. NCHS’ focus is on delivering excellence in education with the highest international standards, assuring students the best learning experience. This is reflected in the prestigious university qualifications offered, the well experienced academic faculty, the modern, state-of-the-art learning facilities as well as the friendly and supportive study environment.